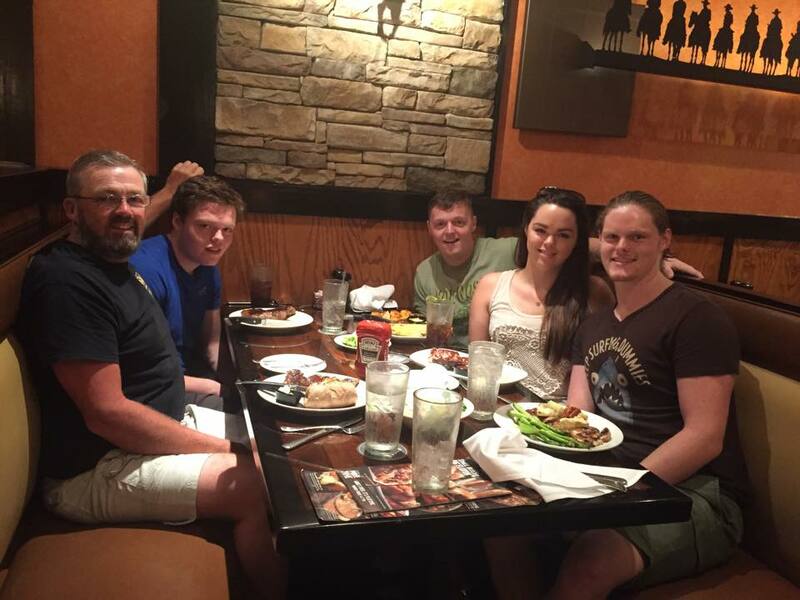 Last night, my family and I went to a local steakhouse for my last meal with them before I return to Ireland for 9 months. This post is about what happened with my diabetes and blood sugar during this meal and afterwards. At the end of the day I am human and have a sweet tooth. I have been dieting for the last 6 weeks and have lost 17lbs so far. Needless to say the thought of a trip to the local steakhouse had me frothing at the mouth. All that was going through my head was steak and cake and nothing else. We sat down to have the meal and I tested my blood it was 8mmol/L or 144mg/DL. So we ordered some starters and I ate some of the bread they brought out and I took four units of insulin in a hurry not putting any real thought into it as I was already pre-occupied by the thoughts of a nice juicy steak followed by a very large fudgecake which I have a minor addiction to. I ate and thoroughly enjoyed my steak with shrimp and we decided against desert , this was a decision the family made on my behalf , a decision which I strongly objected. After all this was my night off my diet and I wanted to eat tonnes and tonnes of the foods that I craved for 6 weeks, and believe me, I did. On the way home I persuaded my brother to stop at a shop. I hastily rushed in and bought a large tub of Ben & Jerrys Peanut Butter Cookie Core ice cream. The same ice cream I had dreams about in the previous six weeks. 15 minutes after returning home the tub of Ben & Jerrys was basically gone. Having not eaten such a large amount of food in so long I fell asleep shortly after. I fell asleep with a full belly and a smile on my face so to speak. In my ice cream coma I forgot to check my blood and give insulin so my blood was 18mmol/L or 324mg/Dl which obviously was very bad. I woke up with my mouth feeling like it was full of sand and immediatly knew I had forgotten so I took 5 units of novorapid and went back to sleep. This was mistake number 2. I woke up at 12.30 and my sister was ready to drive me from my dads to her house where I was staying. Without checking my blood again, I decided to eat two Dunkin Donuts on the way home because this is my cheat day from dieting and I place donuts extremely high on my pyramid of highly desired foods I cannot have while dieting . My blood was 8mmol/L or 144mg/DL before eating and I took another 4 units. (just a rough guess because I was tired and wanted to lie down). I awoke an hour later with a high blood sugar that took quite some time to regulate. So while I enjoyed my evening and meal with my family, my carelessness led to an unneccesary yoyo pattern with my blood sugar. I could have repeated the same evening and had a perfectly stable blood sugar had I been my usually self weighing my food and dosing according to the exact grams of carbohydrates but I let myself loose. Just goes to show that it happens to everyone and it can be easily avoided with some effort and thought. My blood sugar is stable again today and I am back to my regular diet of plenty of fruit, vegetable and lean meats. I just thought I would share this experience with you guys. Has something similiar ever happened to you? I would love to hear your stories and thoughts on this. Thanks for reading and sharing in The Life of Leo.